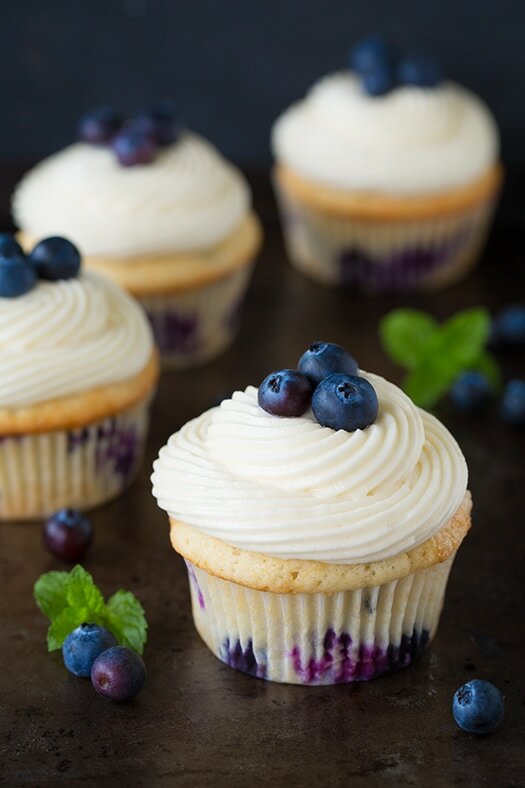 Are you, like me, obsessed with blueberry muffins? Then you have to try these! These are utterly divine! Heaven in cupcake form. You will want to savor each and every bite. I was asked to bring dessert to a family party, and probably eighty percent of the time my dessert of choice to bring is cupcakes. This time around though I decided to bring along a recipe I hadn’t made before. 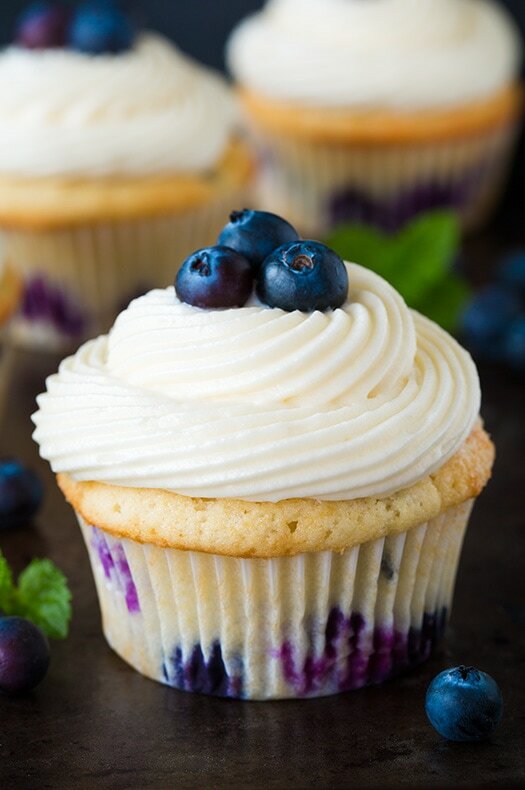 I’ve tried blueberry cupcakes in the past, but they’ve all left me disappointed. 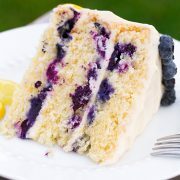 I wanted something that was fluffy and moist, and loaded with blueberries. I didn’t just want a blueberry muffin topped with frosting. So, I’ve created a recipe I feel fits into my requirements. 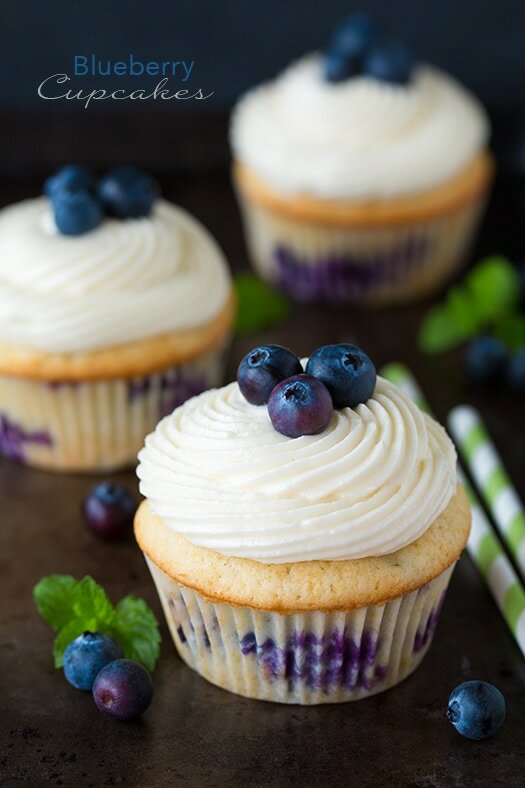 These are the blueberry cupcakes of my dreams! 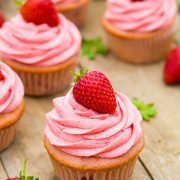 They have the texture of a cupcake instead of a muffin (thanks to the cake flour. Don’t use substitutes). I love that cake flour also allows for more moisture in a recipe. Another thing I did was to use two egg whites instead of another egg. I feel it makes the cupcakes lighter. Then to ensure the cupcakes were moist I added some sour cream, which also helps create a thicker batter than milk alone so the berries don’t just sink. 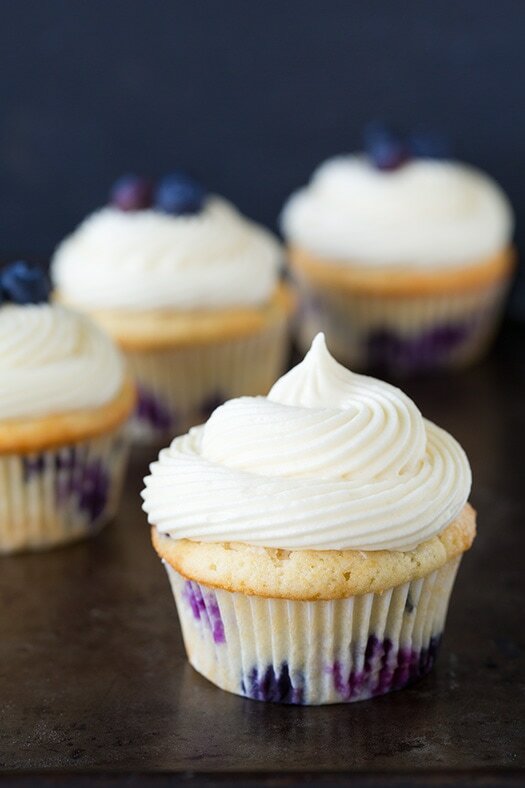 I love the way the flavor of the buttermilk and sour cream compliment the blueberries in a muffin or cupcake recipe. They’re just meant to go together. Then of course to finish these cupcake, isn’t a rich, perfectly smooth, cream cheese frosting a must? If only I could eat them everyday. They are definitely a new favorite cupcake! 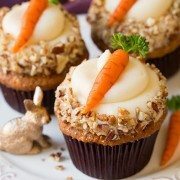 Soon to be a new favorite cupcake! 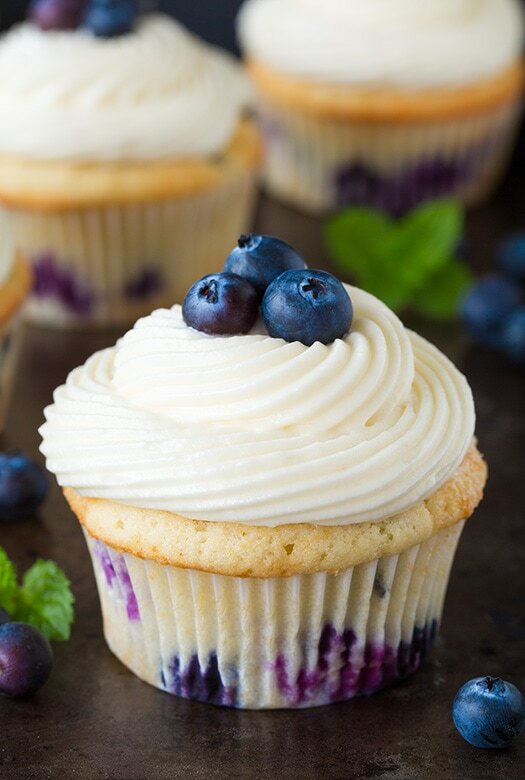 These are light and fluffy and brimming with fresh blueberry flavor, and the frosting is simply perfect! Preheat oven to 350 degrees. Sift cake flour into a mixing bowl, add baking powder, baking soda and salt and whisk 20 seconds, set aside. In the bowl of an electric stand mixer fitted with the paddle attachment (I recommend using a beater blade, otherwise stop mixer occasionally throughout entire mixing process and scrape down sides and bottom of bowl), whip butter and granulated sugar until pale and fluffy. Mix in egg, then mix in egg whites one at a time. Blend in vanilla. 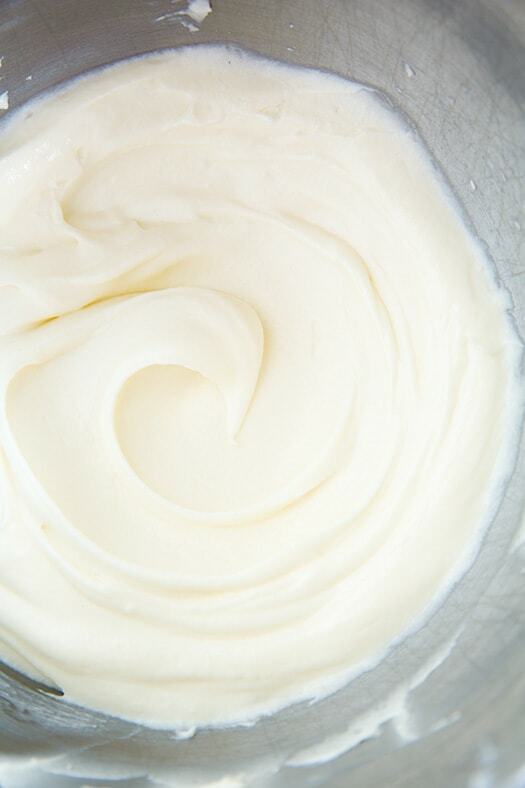 In the liquid measuring cup used to measure buttermilk, whisk together sour cream with buttermilk until smooth. Working in three separate batches, beginning and ending with flour mixture, add 1/3 of the flour mixture alternating with 1/2 of the buttermilk mixture and mixing just until combined after each addition. Gently fold in blueberries. Divide batter among 12 paper lined muffin cups, filling each about 3/4 full (about 1/3 cup batter in each). Bake in preheated oven 20 - 24 minutes until toothpick inserted into center comes out clean. Allow to cool in muffin tin several minutes, then transfer to a wire rack to cool completely. 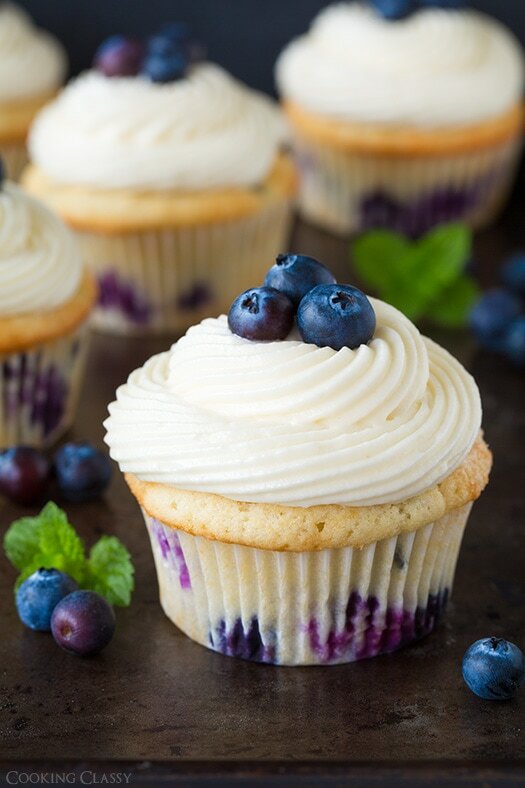 Once cool, pipe or spread cream cheese frosting over tops and garnish with blueberries. In the bowl of an electric stand mixer fitted with the paddle attachment (I recommend using a beater blade), whip cream cheese and butter until smooth and fluffy. Mix in vanilla, then stir in powdered sugar and continue to whip until smooth and fluffy (if it seems slightly runny, chill then stir before piping or spreading). *Just thought I'd throw it out there, if you only have salted butter that will be fine for this recipe, simply reduce the salt to 1/4 tsp. Also, when softening your butter, you can either leave it out to nearly reach room temp, or you can heat it in the microwave, rotating it about every 4 seconds until soft (so it softens evenly). Just don't let it melt.